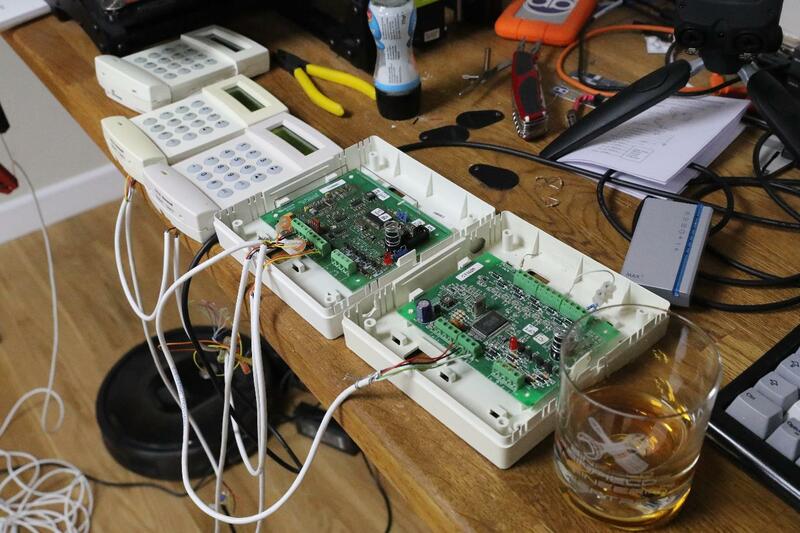 One of the key pieces of equipment for this alarm panel project is a RIO (Remote I/O, I assume). It is what handles the inputs and outputs for the alarm system itself, and one or two of these are normally included on the panel itself. The basic set up has 4 outputs and 8 inputs. There is an RF RIO where the inputs are remote radio things - like battery powered PIRs. It seems to work in the same way, thankfully. The outputs were noddy, I just send a message to tell it the state of the outputs, even if that has some overkill of 3 bytes per output rather than one bit. The inputs were a tad more fun. The concept is that you have a pair of wires to a remote device, or more than one maybe, and you have switches - e.g. reed switch, and you have resistors. It seems (sorry Borg) resistance is not futile. The typically config is a 1kΩ means "closed" and 2kΩ means "open". So you used 2 x 1kΩ resistors with one shorted by the reed switch. Simple. The reason for this is to prevent tampering. Simply short circuiting or open circuiting the wiring would create a "tamper" condition. You can, of course, bodge it by measuring the voltage and fitting a few zenor diodes to match then removing the wiring, but apparently criminals are too dumb to work that out. What is quite nice is that the RIO works out the resistance, to the Ω and reports that periodically. It also reposts the battery voltage to the mV. It is rather nice when something like this goes to the bother of converting data to nice usable units like this. There are, however, a couple of config items, which are slightly fiddly. One of which actually needs the message sending twice, FFS. Why?!?! Does that pre-date checksums? Anyway, one setting per input is response time, and again it converts from nice units an can be set is multiples of 10ms to 2550ms per input. Nice. Another is the resistance thresholds, in multiples of 100Ω. These define the range for the 1kΩ "closed" and the 2kΩ "open", but also a band for "low res" and "high res" to report issues. This means in total five different resistance values defined, and so six states, two of which are "tamper" (open and closed circuit). Anyway, all coded, with events passed up to the application, and inputs that can be used for the door entry system if needed. This basically means I have the key components now for an alarm panel. Next step is the higher level logic for setting zones, and so on. I'll ponder over the weekend. I suspect I'll do a bit of tidying up of existing code before moving on. RIO = Reconfigurable I/O, if it's from the National Instruments range. But then as it's clearly a Honeywell device, then it Remote I/O.